Dental implants offer an attractive and reliable way to restore incomplete smiles. They provide lasting comfort and function and are virtually indistinguishable from natural teeth. I’m Dr. Lee Fitzgerald, a leading implant dentist serving Plano and North Dallas. I have placed and restored countless dental implants to beautifully renew smiles. If you want a permanent tooth replacement option that delivers unparalleled benefits, then dental implants may be the right choice for you. 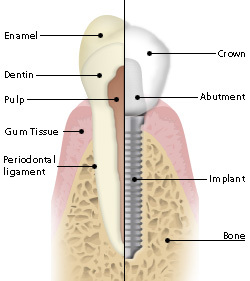 Dental implant candidates must have good oral health and adequate jaw bone mass for successful implant placement. I have extensive training and experience in implant dentistry, and I’ll use modern technology and leading-edge equipment to comprehensively assess your mouth and jaw. You and I will determine the best implant solution to achieve the beauty, comfort, and function that you deserve. Have you been told that you don’t qualify for implants? I’ll evaluate your oral health to determine the underlying conditions that prevented your candidacy. If bone mass is an issue, a bone graft or sinus graft may provide the increased support needed for implant placement. As a leading Plano and North Dallas implant dentist, I want you to experience the life-changing benefits of modern implant dentistry. Let’s get started on your smile! Call today to schedule your consultation at Dental Implant Center, the premier provider of state-of-the-art implant dentistry. How Do You Know If All-on-4 Is Right for You?